Context-embedded learning involves exploration of socially relevant issues. It supports the achievement of core learning outcomes within national curricula while also enabling young people to engage in, develop understanding of, and act on issues that are impacting their families, schools and communities. » Is this not the same as inquiry learning? Context plays a significant role in teaching and learning. It is often used to support engagement, or to demonstrate how concepts can be applied. 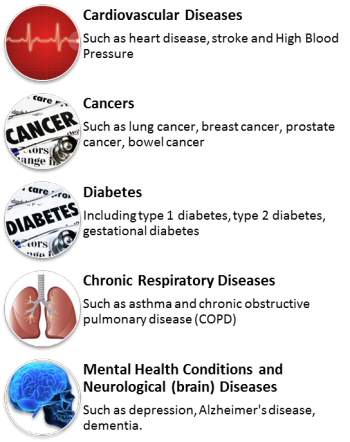 The LENScience ‘Science for Health Literacy’ pedagogical model moves beyond these traditional strategies by embedding learning in exploration of complex, open-ended and values-laden socio-scientific issues (SSIs) associated with health and wellbeing. Increasingly it is understood that education is preparing adolescents with the capabilities (knowledge, attitudes, skills, values and dispositions) required to make sense of and respond to current and future issues and challenges. Many of these issues are complex, bringing together knowledge and perspectives from social, cultural, technological, economic, and scientific viewpoints. Almost all are values laden. To support the development of capabilities to enable young people to become critically engaged citizens, education needs to engage in real issues, allowing students to develop and test their capabilities with issues that are relevant, and ideally that they have some power to act upon. Sometimes labelled as ‘future-focussed learning’, this style of teaching is supportive of young people developing capabilities required to engage in the world of today, as well as those capabilities they need to continue to learn as adults, so that they can engage in the as yet unknown world of the future (Hipkins et al., 2014; Perkins, 2014). We refer to this as critically engaged citizenship, “a way of being that is associated with questioning, seeking evidence and understanding, assessing multiple perspectives and taking considered actions that are mindful of the complexity of the challenges and opportunities facing modern societies” (Bay et al., In Press). A context-embedded learning approach requires learning resources that support students to explore a context. In the case of the HSLeaP programmes these are socio-scientific issues. Through this process of exploration students are supported to develop understanding of the nature and process of science, interactions between science, social sciences, and health, as well as relevant concepts of science, health and social sciences. Appropriate opportunities for development of core literacy and numeracy across the curriculum are plentiful in context embedded learning and should be encouraged. If the learning experiences are built to enable students to engage with appropriately re-imaged scientific, health and sociological data and through this explore the work of researchers and communities engaged in understanding and addressing the issue, students will also have the opportunity to explore aspects of the culture of science and research communities. Is this not the same as inquiry learning? Context embedded learning is indeed very similar to inquiry learning. 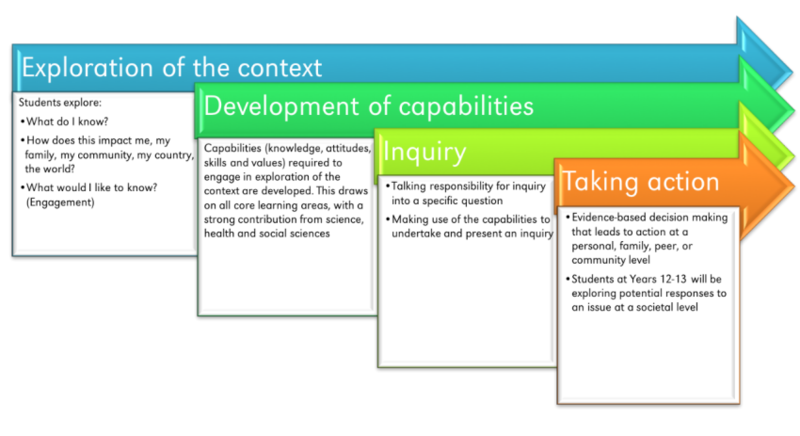 However, inquiry learning traditionally starts with a question posed by the student, and therefore sits within the contextual experience of the student. This process has limitations as the student can only shape questions for which they have some level of experience. Context embedded learning introduces students to a context, allowing them to explore the context and develop potentially completely new perspectives on an issue they are aware of, or awareness of an issue they were not previously exposed to. This allows the student to actively drive the development of a question for inquiry, or to refine a large question to enable focused inquiry. Thus the student is still driving the direction of their inquiry within the context, however, they are not limited by their prior experience to contexts for which they have prior experience (Bay & Mora 2016, page 3). Is the context going to be meaningful to adolescents in the target age group for the particular learning programme? Will exploration of the context support development of understanding of and about science, health, and social sciences? Does the context relate to an issue for which students of the target age-group potentially have some relevant decision-making power? Is the context relevant to the wider community? Is the context important to the science, health, social science and research communities? Do they want to engage with the public in the communication of research related to this context and do they have evidence to share that will be relevant to the community. Noncommunicable diseases (NCDs) are chronic diseases that cannot pass from one person to another. They develop over time, and generally progress slowly. NCDs are the leading cause of preventable ill health, related disability, and premature death in the world today. They impact all communities. However, low socioeconomic communities and communities in developing nations carry the greatest burden of NCDs. the complexity of the ways in which knowledge from science, social sciences and the community needs to be integrated to address aspects of this issue. Of particular interest to adolescents is the evidence that NCD risk is intergenerational, and that their health and lifestyle in the adolescent years will impact on their future NCD risk, and that of their potential future offspring. LENScience resources support schools to include stories of science, scientists (including social scientists) and researchers in learning programmes. This enables students to enter into the world of science, sociology, health and research. Learning should also enable students to take a role as researchers within the setting of their inquiry, using skills and understanding to explore aspects of the context / socio-scientific issue. Before LENScience developed resources for school-based learning programmes exploring aspects of the NCD epidemic, we tested out a range of NCD related contexts classes participating in LENScience Face-to-Face programmes. In the period 2007 - 2008 alone, this involved 5000 students ranging from Year 7 to Year 13 (11 to 18 years of age). The overwhelming response from these students, and those who followed in the period to 2016 was that the NCD-related contexts were engaging. In particular students were interested in the research evidence that demonstrated that lifestyle behaviours during adolescence would influence their future health, and the health of any children they may have in the future. 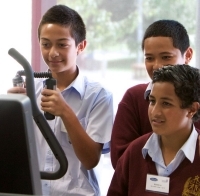 We collaborated with 10 schools across the Auckland region to undertake an in-depth research study to assess the impact of learning programmes combining the LENScience Face-to-Face experience and full learning modules in school. These programmes were undertaken in science classes across Years 7 to 10. 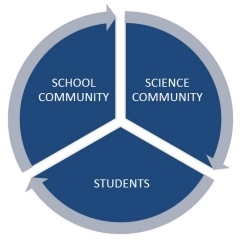 The research demonstrated that across all 10 schools the programmes supported student engagement, increased understanding of the nature of science and of research processes and supported students to achieve learning outcomes connected to the science curriculum. Finally, the research demonstrated that many of the students became science communicators in their homes, and acted on their learning by making and sustaining small but important changes to their diet and lifestyle. The research is published in the Journal of Developmental Origins of Health and Disease and the International Journal of STEM education. We are currently updating these pages so that all learning resources are listed. This work is due for completion in April 2018. Please do not hesitate to contact us if you are looking for resources and cannot see them on the current site.